I love it when a recipe accidentally creates itself! This delicious recipe came about when I was following a recipe that called for chicken thighs and other ingredients that I was to add later--a noodle and vegetable mix, cheese, and more. The combination sounded really good, so I planned to try it. Well, I got busy with other things and forgot about adding the ingredients from the recipe when I was supposed to after so much time. Instead, I left the chicken to cook in the Crock Pot slower cooker on its own. When I remembered to check on the chicken, it looked incredible, and I couldn't resist taking a bite. Oh, it was so tender and tasty that I just had to eat a whole piece of it. I decided to forget the rest of the recipe and just eat the chicken thighs as they were.with the initial spices I had added. Oh, were they delicious! Since then, I have made the recipe again, adding in some spices different from the recipe that inspired this one. I'm still going to try that recipe, but I'm also happy with this simple little recipe that came to be. My accidental recipe is oh so delicious! 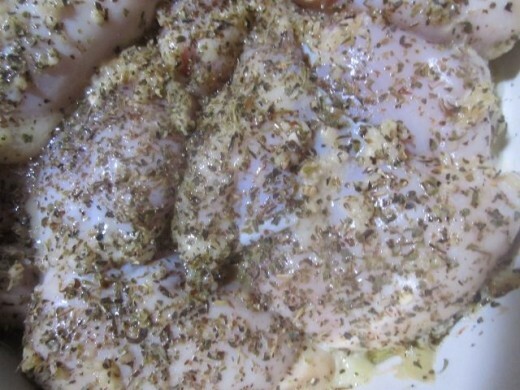 Sprinkle liberally with Italian Seasoning to where the chicken is almost covered. See photo. Add minced garlic, making sure some is on top of each piece of chicken. Cook in slow cooker on high for two hours. After two hours, stir up mixture. 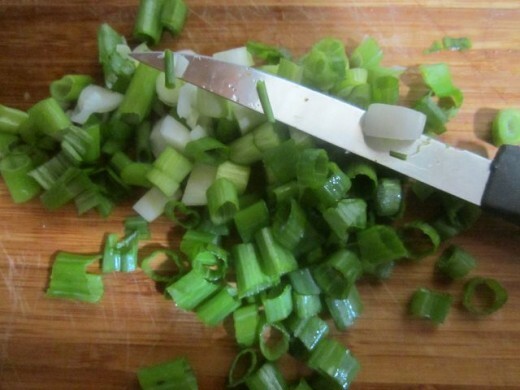 Add chopped green onions on top. Continue cooking for one more hour, either at high or low speed, depending on how fast your slow cooker cooks. If chicken thighs appear to be cooked through after two hours, you may opt to turn the heat to low for the last hour. An Easy Recipe with which to Experiment! 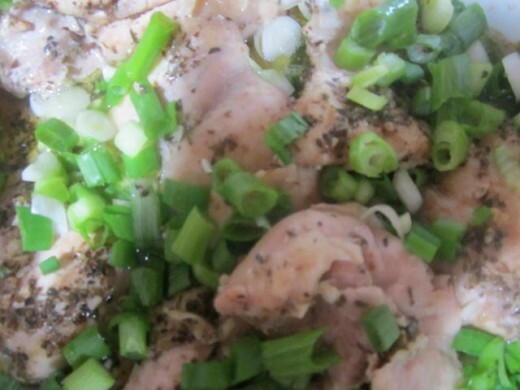 This slower cooker chicken thighs recipe would definitely be a difficult recipe to mess up! It has come out delicious more than once. The second time I made this dish, I left the chicken in the slow cooker on high for longer than I had intended. The chicken still tasted great, as it just fell apart. There's nothing wrong with that. I just scooped up the succulent, tender chicken, along with its natural juices and put it over some brown rice. It was delicious. If you want individual pieces of chicken for everyone, make sure you don't cook the chicken much over two hours. However, if you do cook it for a while, it will make a great topping for rice or potatoes. 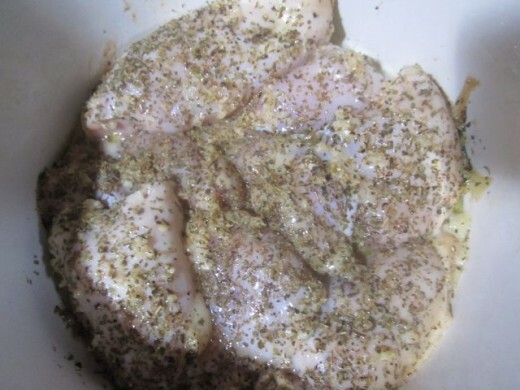 I'm hooked on this accidental recipe and will be making it over and over, I'll probably substitute chicken breasts sometime, something you can also do if you prefer white meat. I will also, I'm certain, be experimenting with different spices, as I love to do. alocsin--Glad you approve! I love those ingredients, too. I hope you try it! 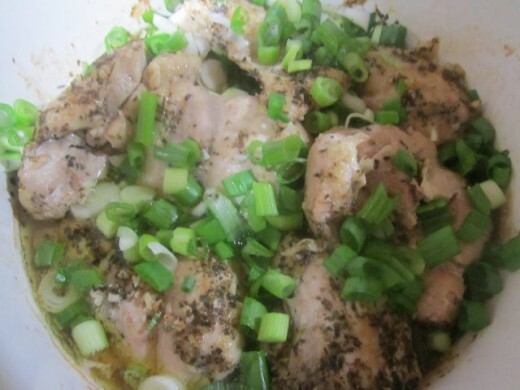 I like how easy this is to make and it includes three of my favoritods: chicken thighs, garlic and onions (green). I'll need to try this out. Voting this Up and Useful. moonlake--It was fun--and tasty! I'm still going to try yours, too. I had already bought all the ingredients!!! random--I know! It makes chicken so tender! This is a tasty one--and so easy! I have recently started using my slow cooker to make a chicken thighs recipe and can't believe how tender they are with slow cooking. This looks great! Dragonfly--I agree. A slow cooker keeps the heat down in the kitchen. I love using it in the summer! Voted up...a definate try. With this heat anything I can cook with out heating up the whole house is a plus! Time to get it out, RealH! I like to use the slow cooker in the summer, too, since it doesn't heat up the kitchen like the stove or oven does. Thanks for coming by! Wow, CC, that's uncanny! I guess we shouldn't be surprised anymore, huh? Wowza!!!!! I don't see how this could not turn out fantastic! True, Carol. Cooking easy recipes with slow cookers frees up our time! I love mine. lady rain--It's great! So tasty! "I forgot about adding the ingredients when I was supposed to, "
Josh--make it! It's easy--and tasty, too! thanks for the stars! 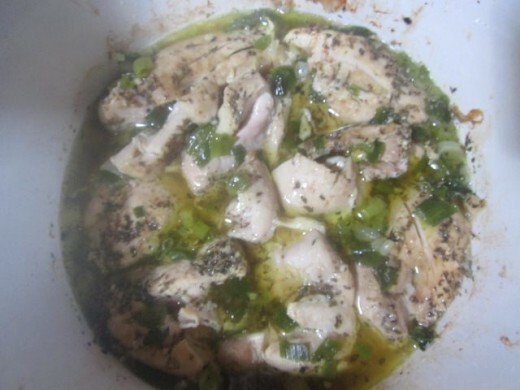 I love this recipe and when chicken is juicy and tender. And using a slow cooker leaves you free to do other things. I love using my slow cooker because it is so easy to prepare a great dish. Will have to try out this recipe soon! I am sure it is going to be awesome! harryspencer--I find this recipe very, very tasty! You are cranking out those recipe hubs! And this one looks really delicious! I need to actually start making some of these recipes, PRONTO! LOL :) Thanks Vicki! Five Stars! This sounds like a wonderful recipe. I can't wait to give it a try!